The Bowhunting World editors put some of the newest carbon hunting arrows to the test. Check out what the found out. Your first impression picking up one of these is: “There’s a lot going on with this arrow!” The Mayhem is built with a weaving process of the carbon fibers that leaves a visible woven pattern on the shaft. The nock fits into a metal “bulldog collar” that adds strength and durability to the arrow and, along with the bold graphics, gives the arrow its distinctive appearance. My test arrows were of the 350 size (9.8 gpi), which is a fairly heavy shaft to shoot from my 65-pound Mathews. But I personally prefer the heavy arrows—the added energy absorption and delivery—and loved the way these felt as I shot them. Very solid. Mayhem shafts are available with Blazer or Fusion Vanes: straightness +/- .0035, weight tolerance of +/- 1.0 grain, and a spine selection tolerance of +/-.0025. Available is the Mayhem ($119) or the Mayhem Hunter ($129) with built-in weight forward. The VForce is Victory’s essential hunting arrow, a multi-layer fiber-wrapped arrow. I tested the V1 series (the straightest, with a tolerance of .001) in size 350, shafts that weigh 8.8 grains per inch (gpi). 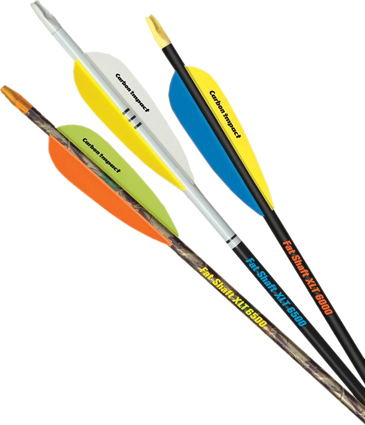 This model is available with either 4-inch Duravane or 2-inch Bohning Blazer fletching. I shot the Blazers. Considering how this test quickly adopted an “extreme speed” theme, we were hoping to include Gold Tip’s new, ultralight Velocity series arrows. Alas, they were not available at press time. But then a strange thing happened. We tested Gold Tip’s proven Pro Hunter—an arrow that’s been around for 12 years—and saw it claim an impressive third place in our speed test. It shows Gold Tip has known about the advantages of increased speed for quite some time; even more impressive is that all-carbon Gold Tip arrows are respected for their durability, a quality to which I can attest. Most any company can shave grains from a carbon shaft to make it lighter; the trick is ensuring it remains tough enough for hunting. Pro Hunters certainly are. They’re also the straightest arrow Gold Tip makes, with a tolerance of +/- .001 inch. The Blast is a narrow, woven, seamless carbon shaft from Trophy Ridge with several interesting features. The shafts are among the smoothest around and are treated with a substance called Silent Slide that makes them draw quieter, penetrate deeper, and pull from targets easier. I found them to perform in all three areas. I am a long-time fan of the thinking behind Carbon Tech arrows, with a selection of models designed to match the performance preferences of different bowhunters. CT arrows most notably emphasize speed or energy. The 45/70 Cougars I got to try are a mid-range arrow at a very reasonable price. The matte finish on Cougar shafts does not glare like the smoothest shafts, something a hunter can appreciate. The fletching on the arrows I tried were three, 4-inch plastic vanes (sporting the CT logo) in a virtually straight orientation. I was concerned how that might handle broadheads, but the 100-grain Muzzys I tried flew fine. Newly released in March, Carbon Impact’s new Hunter+XLT shaft is a variation on the previous Fat Shaft XLT model. Like its predecessor, the arrow features the XLT construction technology that is uniform and seamless as well as a weight-forward design. It comes in three grades and three spines. The main difference is a new finish; the Hunter has a lighter, but smooth and glare-free finish.